The Dylan Flinchum "Rock On!" Foundation was established to help provide love and support to Mike and Melissa (Larsen) Flinchum and their beautiful three year old son, Dylan. Shortly after Dylan’s second birthday, he began to experience difficulty walking. After being referred to several medical specialists (including some of the top neurosurgeons in the country at Cornell Medical Center in NYC) it was determined that Dylan had a condition known as Chiari malformation. Dylan underwent surgery in the spring and was expected to make a full recovery. After several weeks of physical therapy, Dylan was not progressing as expected and began to show symptoms that were unrelated to the malformation. A follow up MRI was completed and doctors were shocked to find significant change in Dylan's white brain matter. After getting the initial diagnosis from Cornell, Mike and Melissa traveled to the Children’s Hospital of Philadelphia (CHOP) where it was confirmed that Dylan is suffering from a degenerative disease known as metachromatic leukodystrophy, often referred to as MLD. As they all prepare to cope with this horrible disease, everyone is focused on one thing: Dylan. Their goal is to make Dylan as happy and as comfortable as possible while bringing as many smiles to his face as they can. In order to best achieve this, they will likely be missing extended periods of work as well as making many trips back and forth to various Pediatric Specialists to be sure that they are providing Dylan with the best care that is offered. Dylan will also require special medical equipment and various types of therapy to make him more comfortable as the disease continues to progress. The Dylan Flinchum "Rock On!" 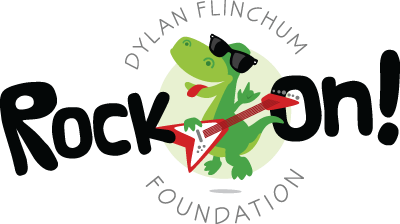 Foundation has been created as we all want to help ease just some of the burden Mike and Melissa are facing so that they can devote all their time and effort on Dylan. Please also visit our Facebook Page to send your kind words and prayers to Mike and Melissa as they need all of our love and support. Please keep the Flinchum and Larsen families in your thoughts and prayers! Overall, Dylan continues to amaze us with his health. We have an amazing team of home nurses, doctors & their nurses, and respiratory therapist to thank for that! They are proactive with his care which has allowed him to stay hospital free for any respiratory illnesses over the last 6 years which is pretty amazing with his disease. His medical team consists of a Neurologist, Pulmonologist, Respiratory Therapist, GI Doctor, Nutritionist, Physiatrist, and Rehab Technician plus our wonderful home nurses who we would be lost without! We see these doctors every 6 months unless there is an issue. Naturally, due to his respiratory issues we see his pulmonologist way more than the rest. We also continue to have the support of our Pediatricians office who is always there for us when needed. Dylan has a rigorous respiratory treatment regime daily that includes nebulizer treatments, percussion vest, manual CPT, cough assist and lots and lots of suctioning all day long. He gets these treatments 1-2 times daily but it gets increased if needed and on a few occasions we had to do them every 4 hours around the clock. Luckily, he normally responds well to these treatments so while we don’t enjoy those round the clock periods we are thankful that it is few and far between and we will do whatever we can to keep his lungs clear. Dylan takes many medications to help with his comfort, seizure activity, nerve pain and GI issues. He continues to be fed through a G-tube via bolus feeds during the day and feeding pump overnight, we are very fortunate that he continues to tolerate his feeds well. We don’t know exactly what Dylan can or can’t see but we made the decision that we don’t want to find out & will continue to treat him as if he can see, with that said, you put a book in front of this boy or a favorite cartoon and you can see those eyes following. Our biggest heart ache since my last update is that Dylan no longer smiles or shows emotion, as parents we believe we know when he is happy through his face and eyes and he will express extreme discomfort (which thankfully isn't often). We miss his voice and his smile more then anything but again we are thankful for his comfort and overall health. Dylan is now about to start 3rd grade!!! He started at our local public school in Kindergarten and has done amazing with their support and flexibility! He attends school for about 3 hours/5 days a week, depending on him. Some weeks he misses a day or two if he is tired or just having an off day. The school nurse is also wonderful at letting us know if something pretty contagious is going around the school so we can keep him safe at home. His nurses are also pretty stealth at avoiding the sneezes and germs as much as they can. Some days he likes to sleep through school, we think it’s because he’s totally relaxed plus the fact that he likes to wake up between 3 and 4 am and is ready for a nap come school time! Some may wonder why we continue to send him to school if he sleeps but I can assure you he is fully involved in activities while sleeping, he is talked to, read to, involved in hand over hand activities etc. He has had wonderful teachers for the last 3 years and we are looking forward to seeing what 3rd grade brings. Kindergarten was a pivotal year for us as it was our first time in a public school and really exposing him to the community that we live in (he has been very exposed to our hometown over the years). Kindergarten could not have gone better due to his wonderful teacher and the students in that class, as well as the administration who has been wonderful to work with while ensuring his needs are all met. Of course as you rise in grades school becomes more focused on academics which is not as important to us as interaction and being exposed to things he enjoys. Dylan’s school has been great in listening to our concerns and is always trying to find ways for him to get the most out of his time there, allowing him to float between classrooms, be part of specials, and amazing teachers who are willing to adjust their daytime schedule so he could enjoy things like science over math while he’s in their classroom. He has an amazing team of therapist including a Physical Therapist, Occupational Therapist and Speech Therapist. They have done so many fun things with him, especially this last year, and have taught Mike and I so much. They have allowed us to see him doing things that other kids his age are doing and are very creative in making sure his time with them is special. They truly want to give him all he deserves and more. We couldn’t be happier with how school has worked out for him and we will continue sending him until the bad days outweigh the good days. Our goal has always been to give Dylan a full life until he lets us know he can no longer handle it, he is our guide and we are grateful that he is such a strong guide who has allowed us to experience so much in 6 years. Dylan loves to be read to, listen to audiobooks, spend time on his iPad, and watch his favorite shows or movies. We try to make sure we are always talking to him and telling him what’s going on around us or what we are doing if he can’t see us or feel us right next to him. We try to give him choices using eye gaze, as I said earlier we aren’t sure what he sees, we believe he does see but has difficulty processing so sometimes he makes very quick decisions and sometimes it’s hard to tell and I feel bad because I probably made him watch a movie or read a book that wasn’t really his choice. We spend a lot of time with our family, with both sets of grandparents coming up one afternoon every week to spend time with him. We see his aunts, uncles and cousins as often as possible and they are so loving, wonderful and kind to him. We also enjoy seeing our extended family as much as possible where he is surrounded by great aunts and uncles and second and third cousins who all love him so much. We spend time with friends as much as possible and go on adventures as often as we can. Dylan has been on two cruises and we are looking forward to another early next year and he has spent a week every summer at the shore with our entire family. We’ve had a lot of mini adventures over the years and are lucky he is such a good traveler and sport. He truly and simply amazes us and allows us to experience as much joy and life as possible while we can with him. Last but not least, our village! Over 6 years our village has grown and we are surrounded by so much love and support from family, lifelong friends, old friends who became new friends again, strangers etc. We could never put into words, although I have tried, how much you all mean to us each and every day. This journey is not easy but we are truly surrounded by a circle of people who are always there for us, for our closest friends and our families. You all humble us by the way you always step up as individuals and as a community whenever we need it. We enjoy seeing you out and about and your kind words always lift our spirits. While we will never understand why this happened to us or to anyone knowing the impact our superhero has made on so many makes the understanding a tiny bit less important so thank you, thank you, thank you. Overall, Dylan’s health is good. Over the past year and a half we have started many treatments to help it stay that way and also have may people involved in his life to help with this. In January of 2012 we started the transition from his team of doctors at CHOP & researched doctors closer to home. We wanted to have all of his team, including his pediatrician, out of the Goryeb Center in Morristown, NJ. We were extremely lucky to find a great team including a Neurologist, Pulmonologist & Respiratory Therapist, and GI doctor & Nutritionist. He still sees his Physiatrist out of Children’s Specialized Hospital in Mountainside, NJ. Our main reason behind doing this is we wanted him to be close to home so if the time comes that he needs a hospital stay our family and friends will be close and can see him and help support us. Dylan has two amazing nurses who are with us Monday-Friday for the full day. Dylan receives Physical Therapy 2 times a week, Occupational Therapy 1 time a week and also has a teacher come to the house 2 times a week through the school system. In addition, Dylan still attends KEEP, Inc., a few hours a few days a week. His nurse goes with him and we truly believe that this continued interaction has done so much for him and he loves to see his friends and his teachers. We do keep him busy but also know when to give him a rest. Each day Dylan gets 6 medications, at various times and doses. Each day Dylan has a “Vest” treatment, his “shaky vest”, when he isn’t feeling well he gets this 2 or 3 times a day. Each day Dylan gets a Cough Assist treatment, again when he isn’t feeling well he gets it multiple times a day. We also do regular chest PT throughout the day and range of motion activities. Again, his days are pretty full but we are fortunate to have help. When he isn’t feeling well these treatments are a full time job. Many times children do not have access to the machines that do these treatments until after they get sick and have a hospital stay, we are fortunate that his Respiratory Therapist & Pulmonologist think like Mike and I do and would rather be proactive and do these things to help prevent any sickness. The support of the foundation has also played an important role in this because we have the means to get what we need for him, even if insurance doesn’t cover it. Dylan is still very wide eyed and attentive, he loves to be read to, he loves to watch his shows on Disney Jr., he loves to be outside and go places and he loves being around his family, especially his cousins who are all so helpful with him. We do know that this all can change in an instant so we try never to take a day or moment for granted. You all help us do that with your support, not having to worry about how we are going to pay the next bill allows us to enjoy every special moment with Dylan and we are forever grateful for that. In addition, we have been able to pay it forward throughout the past year and have done things to help bring a smile to other children and their families. Thank you for allowing us to do that, it helps to feel that through this journey we are able to help others while we raise awareness.